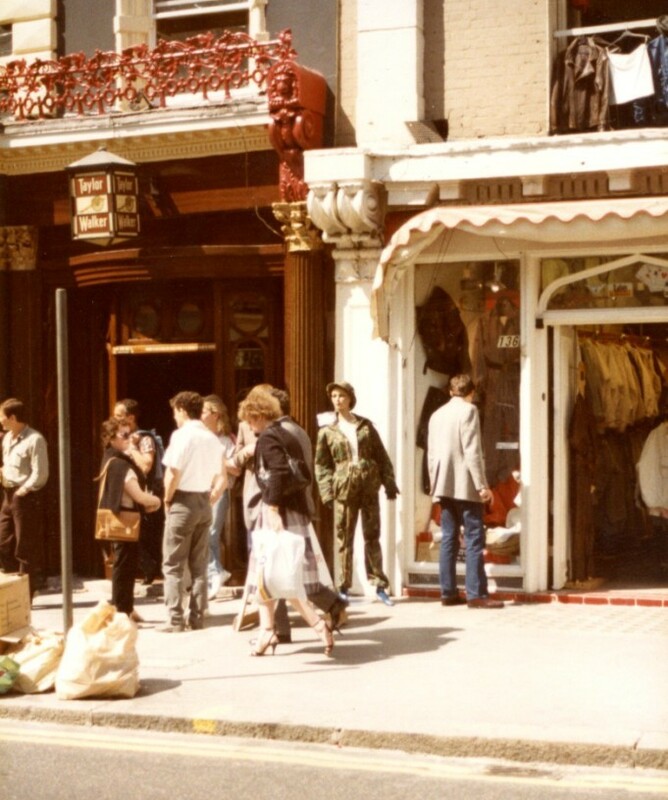 We’re back on the King’s Road this week for some more summer in the city pictures of retail life in the 1980s, for some as much of a golden summer as any years in the previous couple of decades. And as before, our guide is the roving eye and camera of my friend CC. 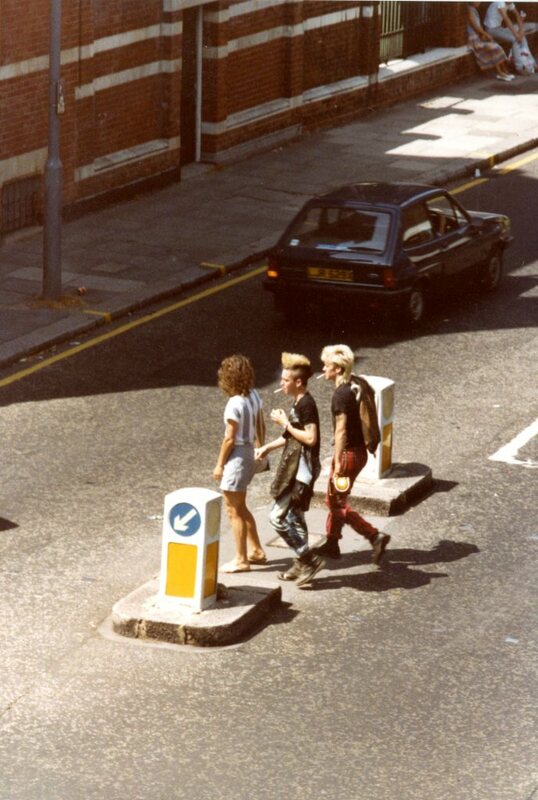 Here a couple of smoking dudes with elaborate hair cuts linger briefly in the middle of Sydney Street behind an unconnected woman, the three of them waiting to cross. CC started like this with pictures taken from an upstairs window. It was a useful vantage point but it was never going to last. She had to get down to street level. The register office steps of Chelsea Old Town Hall, where people often pause to sit amongst the confetti, although not for too long as people keep getting married. 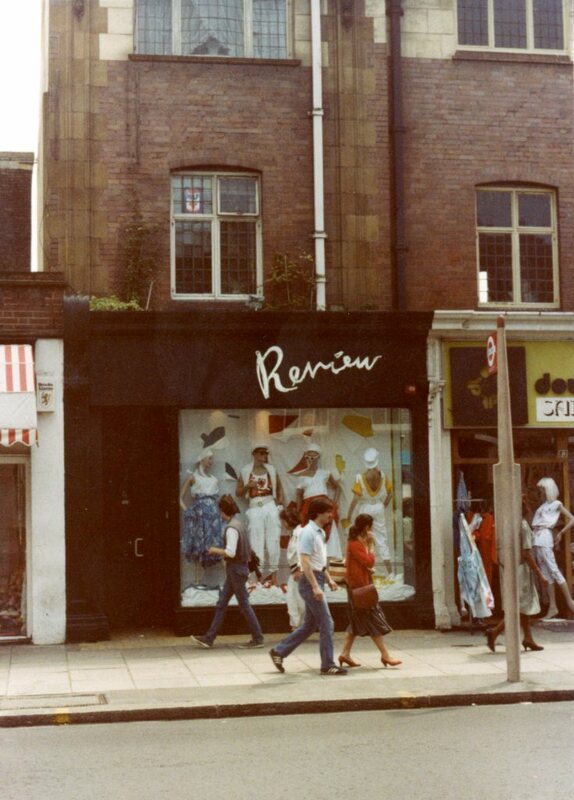 Review was at number 81a, and despite the interesting walls and windows above (which look quite familiar to me) the building is now gone. 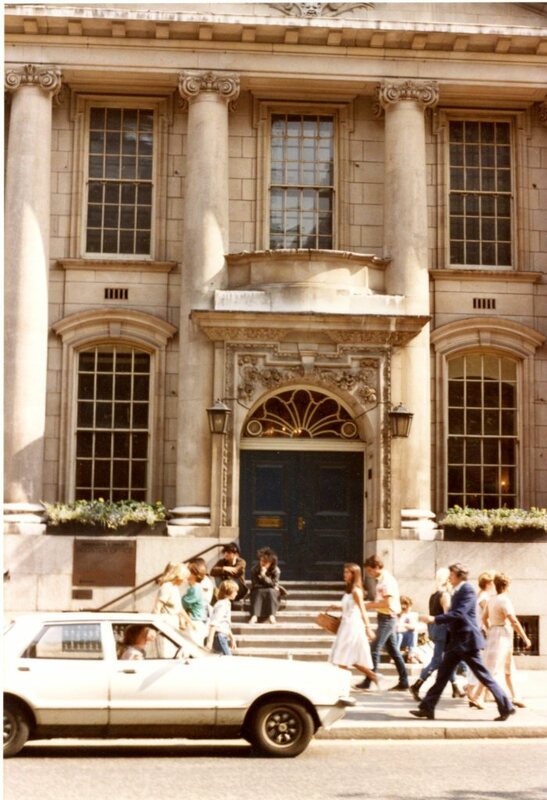 I actually had trouble with this one but this is the corner of Tryon Street and the Bertie, plus the corner shop (Just Men) at number 118 is where Muji is today. They’ve done away with those pillars. (not structural as it turns out). The upper floors are usually the feature that helps you to place a building. A little bit of art deco going on there. Below, the actual Markham Arms. And a shop full of clothes on hangers, crammed in up the first floor. Is it me or was there a lot more stock on the shelves in those days? I think that might have been Abidat, who dealt in army surplus gear, as many shop still did at this time. 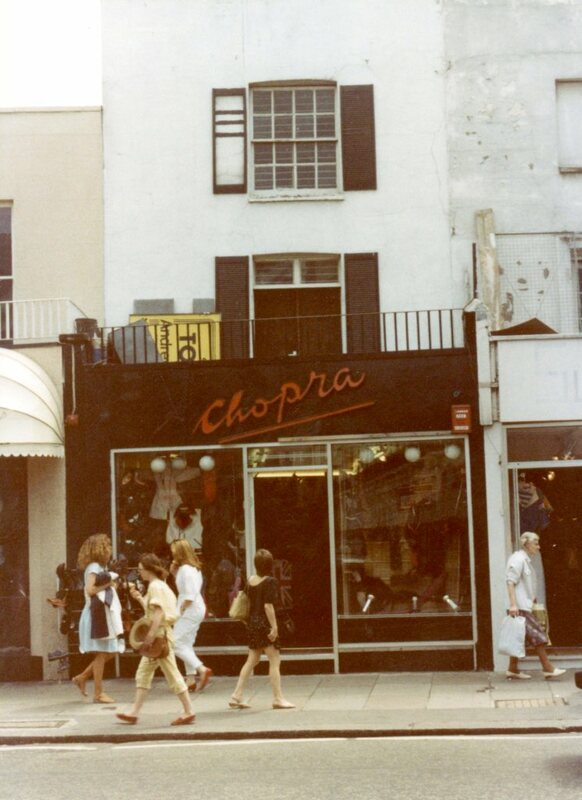 Chopra was at number 73. Another vanished building. Holland and Barrett are there now in one of those Egyptianate (is that a word?) buildings you see now, with the top of the structure curved outwards. At this point we need a slight break, so here’s another smoker. 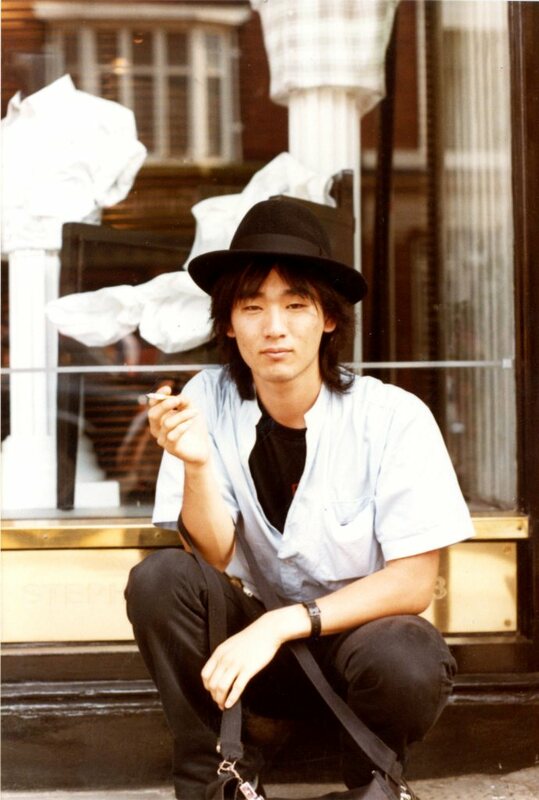 Casual as you like, with a look that’s still worn today, and below, a couple of non-smokers (I hope). Those two just caught CC’s eye. We talked about it, and yes we knew it wasn’t the King’s Road but I liked it so I’ve included it. Somewhere in Vauxhall I think, but we’re open to suggestion on that one. This location is still with us. 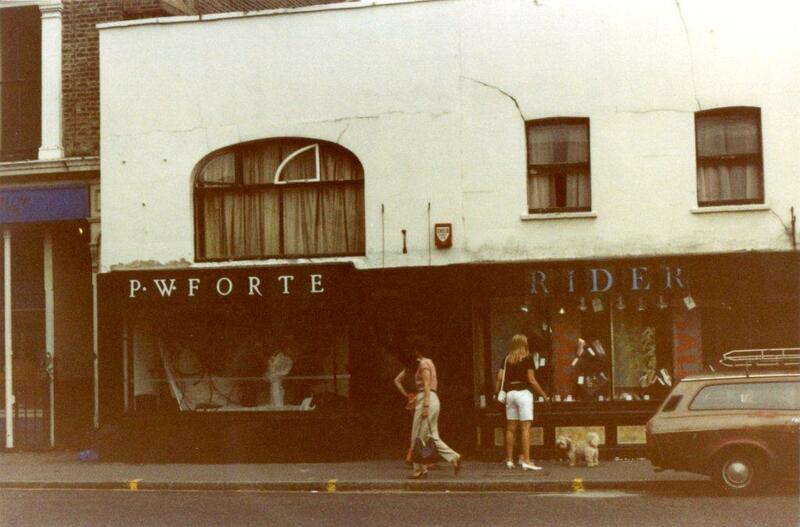 Rider, sold shoes, as so many high street shops did. P W Forte? I’m not quite sure. This photo may be a slightly different date. The window line has been tidied up since the picture and now looks uniform, and a little cleaner. The handbag store Bagista was there when I checked Google Street View earlier but I think they’ve moved back to the King’s Walk mall. To get ahead of Goggle I went and checked in person, and found Blaiz, an attractive South American fashion boutique now occupying the space. The lady below has not moved, and is thankfully a permanent and unmistakable King’s Road feature. I don’t know what she was celebrating with pink balloons that day. The final picture taken nearby, near the Chelsea Potter features another well known character, and this is the companion to the picture of Leigh Bowery and Trojan in the first CC post. 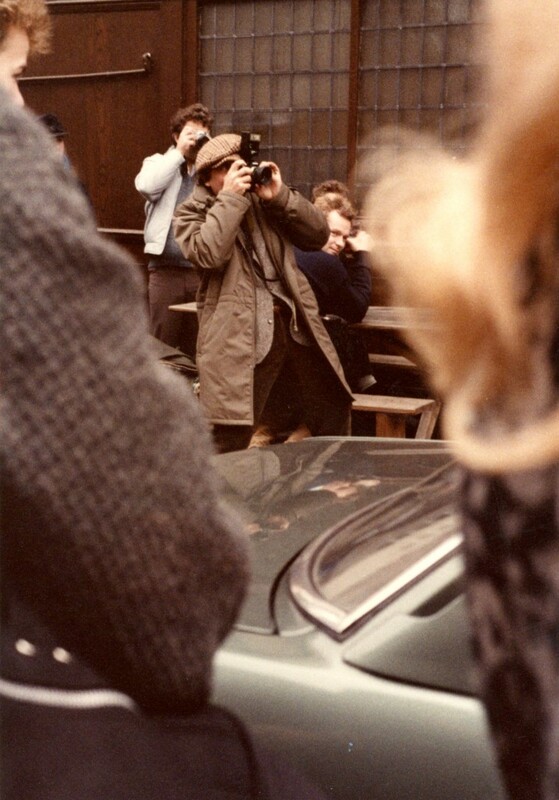 It is of course the somehow unmistakable David Bailey, attracting a bit of a crowd as he works. 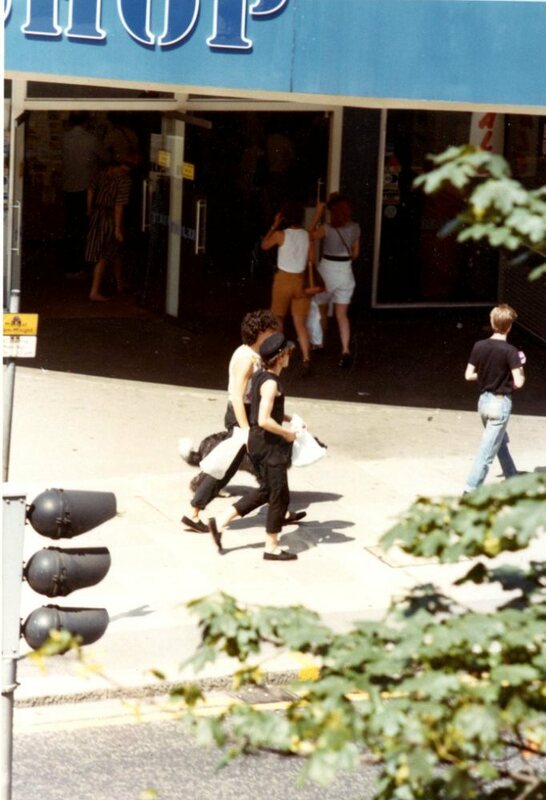 More 80s shop fronts, passers by and local characters in the next CC post, but that will not be for a while. CC herself likes to read about something else, and who can blame her? I’m starting a Kensington based epic next week. More by luck than judgement today’s post goes out on the summer solstice, so I wish you all a pleasant sun-drenched summer whether you spend your time by the sea, in the country or in the heart of the city. This entry was posted on Thursday, June 21st, 2018 at 9:27 am	and tagged with CC, King's Road and posted in 20th Century, Chelsea, Shopping. You can follow any responses to this entry through the RSS 2.0 feed. The pub is the Markham-not the Marlborough. Of course! A slip of the brain. yes, an error on my part – too much sun. P.W.Forte. Paul Forte was my brother in laws brother in law. 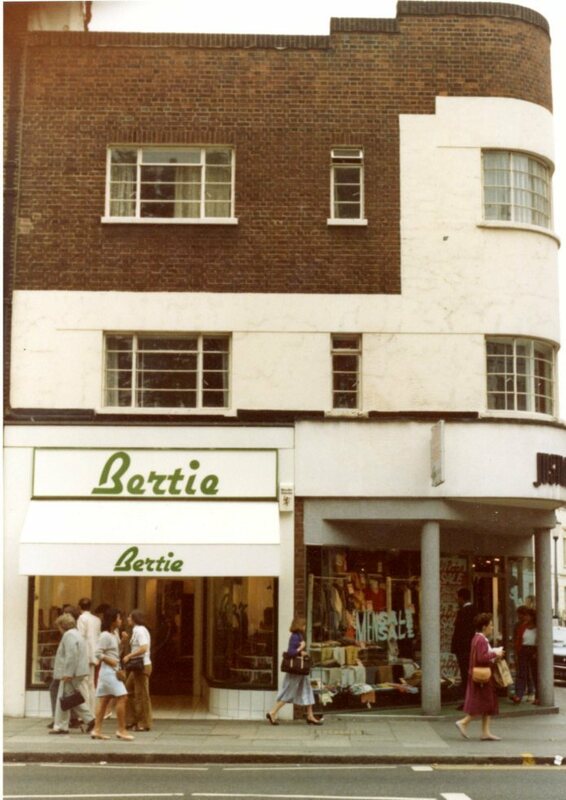 I remember often going down to collect my brother in law David MacDonald back in the mid eighties from the basement of Pauls shop right under the Kings Road. Paul and David were heroin addicts and down in that basement others like Charlie Tennant and Hans were often gathered,I am sorry but I don’t remember Hans second name. They are all dead now so sad really. Paul was a lovely guy a fellow Scotsman he was very creative and his clothes were very cool. He was connected to Charles Forte of motorway cafe fame. It’s strange how a photograph on your fabulous blog David can bring back such vivid memories. Interesting read. Im Naldo…Pauls Brother. On the other hand, re Michael Gall’s remark above, I have no idea how many times I must have gone down Kings Road [I grew up behind Chelsea Barracks, technically I was in Westminster as the Westbourne was under our back boundary wall] and none of them ring a bell except the classical figure which I guess is on the Pheasantry. Has it survived? 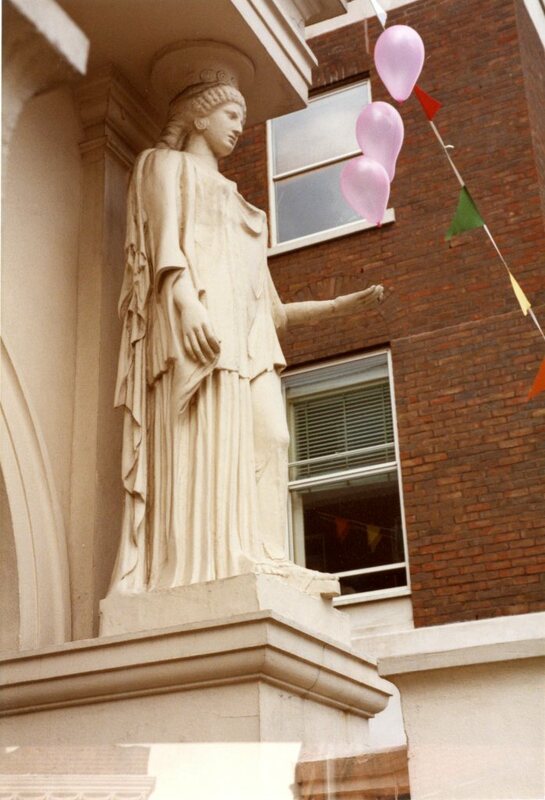 Yes, the statue is still there on the Pheasantry, and has been painted various colours in its lifetime. It was once red if memory serves. Back to its normal stone now. Thanks for that Chris, at least I’ve not forgotten everything! It’s so fascinating to see the places I recognise as they were in a completely different era. 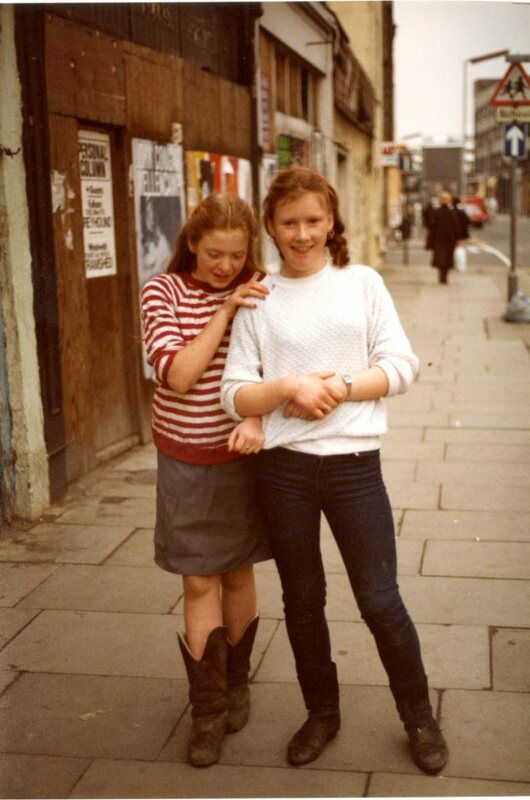 I was born in 1978 but only discovered the King’s Road in the early 90s. Thank you for such a great post and wonderful pictures.